I've made it my mission this year to start getting ready for Christmas before December 24th. The past few years were so hectic and busy for me that I felt like I was holding on by a thread, cramming for Christmas, and inevitably forgetting someone special in our world. This year will be different because I've got a plan. Second, I'm doing the bulk of my holiday shopping online and have had so much fun and made so many discoveries, that I even created my own gift guides for you to use as a resource. I can't wait to share with you everything I've found for both him and her, do stay tuned as I'll be releasing my holiday guide over the next two Wednesdays. One of my most important gift lists I have are for Kenya and Chloe's teachers. We feel so blessed that both of our kids are in the care of such remarkable, loving, wise adults who teach and guide then everyday and words usually fail to convey the depths of our gratitude for them. 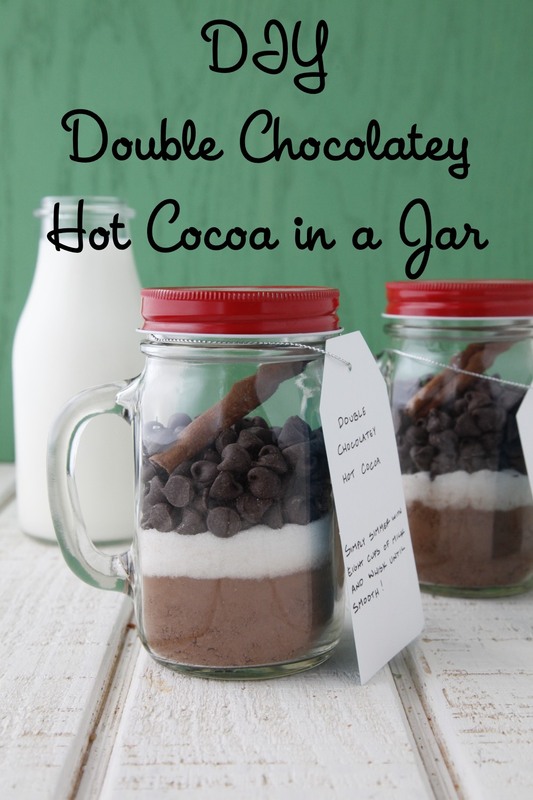 This DIY Double Chocolatey Hot Cocoa is a fun and affordable gift, and you can start making it now in re-usable mason jars. I like to create my own cute personalized tags which feature the recipe, a special note, and even add a gift card to their favorite store. It's also a great project for your kids to help you out with. We're making more of these than I think I need because without fail I will remember someone at the last minute and I'll be relieved to know I've got something sweet, special and homemade on hand to give! 1. 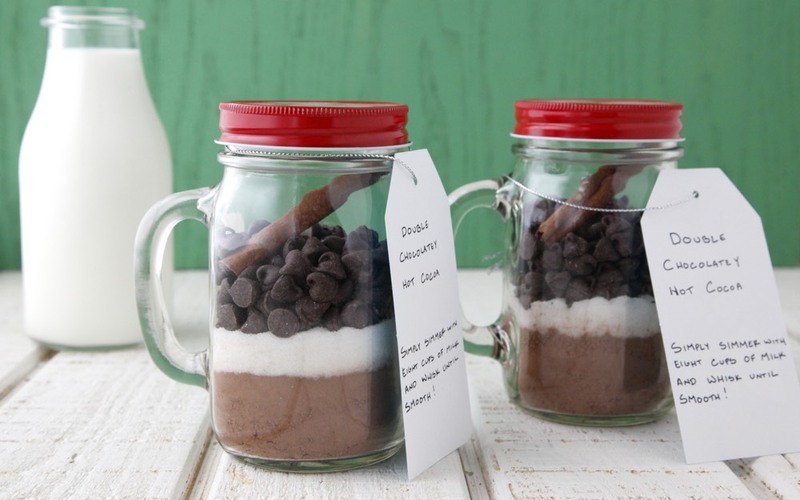 In a small mason jar, layer the cocoa powder, sugar, chocolate chips, and top with the cinnamon stick. 2. Place the contents of the jar in a medium saucepan with 8 cups of milk. Simmer until the chocolate is melted and the hot cocoa is warm and smooth. This is so cute! I am going to include this with my secret santa gift at work. Thanks so much! These ones do not. You have to purchase the lids separately. Any alternatives to mason jar you can think of? Crunched for time!! ;) Hannukah party tomorrow. Hmmm any reusable jar should work! You could even use a large coffee mug! You should be able to find mason jars in your local grocery! They're sometimes hidden in the baking aisle, or on the very top shelf of a random aisle where you wouldn't think to look! did you include the directions? I can't what the paper says. this is such a fun idea! The directions are on the recipe card! Hi! Great idea and so festive. Was able to find the (lid-less) mason jars online but where did you order the adorable red lids from? Thanks! Just found this site (thank to Pinterest) and I love it! 8 cups of milk? is that right; or is that supposed to be 8oz of milk making one cup for the whole jar? Any tips on where to find lids that fit the jars you linked to? Are they regular or wide mouth mason jars? Is there a link for printing the tag you show in the picture? I just wrote the directions on a gift tag! Where to get the lids? Dec04 Write more, thats all I have to say. Literally, it seems as though you reiled on the video to make your point. You clearly know what youre talking about, why throw away your intelligence on just posting videos to your blog when you could be giving us something enlightening to read? These are so cute! Do you think I can fit them in 8oz mason jars instead of the 16oz? I am looking for something just a little smaller? Maybe if I don't include the cinnamon stick? I love making things like this for gifts. People seem to really appreciate the effort that goes into homemade gifts. I love that you used jars with handles. I now need to run out and find those. I'm obsessed with mason jars. Hello! May I know if it's possible to change the 8 cups of milk into dry powdered milk to put into the jar too? and if so, how much would that be? :) Thank you! You have such great edible gift ideas. I'm thinking next cookbook for you should be: Weelicious Edible Teacher's Gifts. I just made these for hostess gifts and they looked adorable. I wrapped some ribbon around plain mason jars and attached the directions on the back of a large holiday gift tag. Super simple. Thanks, Catherine!! Has anyone tried making it with water instead of milk? I have some friends with a lactose intolerance and wanted to know if you could just simmer it with water or if you would have to use a milk substitute? 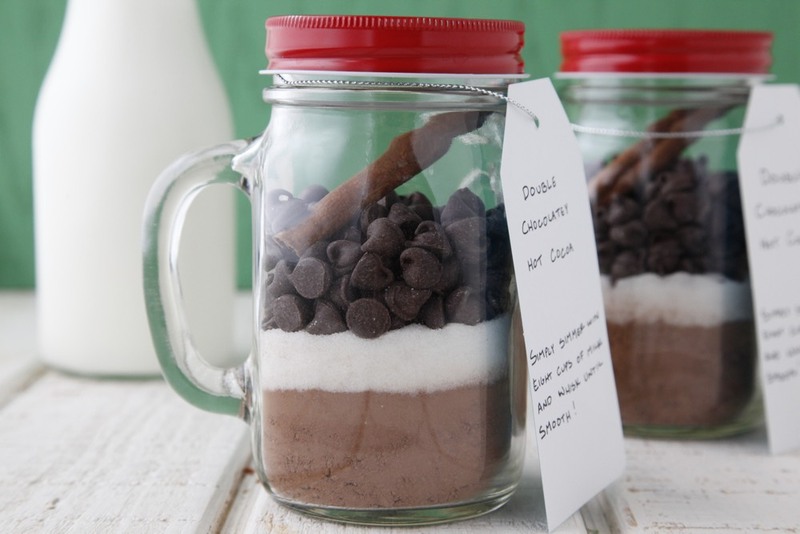 You would need to use a milk substitute because the cocoa powder won't dissolve completely in just water. How much cinnamon would you use in this if you put ground cinnamon instead of a stick? About 1/2 teaspoon! 1 full teaspoon if you like it really cinnamon-y! Semi-sweet, but you could use any you prefer! My kids LOVED making these with me. We used the smaller size (pint?) mason jars, and instead of including the cinnamon stick, I cut a circle from waxed paper to put on top of the chips and added mini marshmallows on top (to keep them separate). They turned out really cute! Thanks for a great idea. how do you make a single serving size? a single serving would be 1 cup milk plus 2 tablespoons of the mixture! Where did you get the lids for the mason jars? It didn't look like the amazon ones came with them. I would love to make this for my co-workers. Would I just divide the recipe by 8 to get single servings? I think if your co-workers have a couple of children you would give them the full recipe. For a couple you could 1/2 the recipe. I wouldn't give someone a tiny jar with enough for only 1 cup of hot chocolate. Yep! That would make 1 single serving of cocoa. I made these to give as Christmas gifts this year! They were fun to make and a practical and unique gift for families :) Thank you as always! I am going to make these. They look supercute and homemade and they are simple! What size jar did you use?